As Jeremy Ashburn mentioned in the training video inside the SiteBildZ platform, this module focuses on the following: ArticleZ, Article Builder, ArticleBildZ, Own Content and scheduling and posting articles. This module can be found at the left side of the SiteBildZ tool. It has five subtopics that are quite straightforward to use. All you have to do is pick the content service you want to use for your projects and ensure that you have the appropriate amount of funds in your account (through the Funds Manager). Make sure that you have at least $10.00 in your account to be able to fully use the content service. Let’s move on now to the five main features of the module, shall we? The second service from the SiteBildZ team, ArticleBildZ has the same features and options as ArticleZ. As with all content management services, you will have the option to add your own content to the SiteBildZ platform. This option is patterned over WordPress so it is very easy to use. This feature can be used with all of the four content creation options cited above. The great thing about it is that you can schedule when a post will be posted on your site or if you want to backdate it. There is no denying that SiteBildZ is packed with a lot of features designed to make affiliate marketing much easier for any marketer. 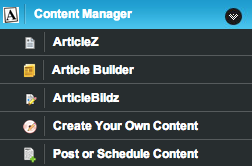 The SiteBildZ Content Manager is definitely one of the most useful yet very easy to use features.